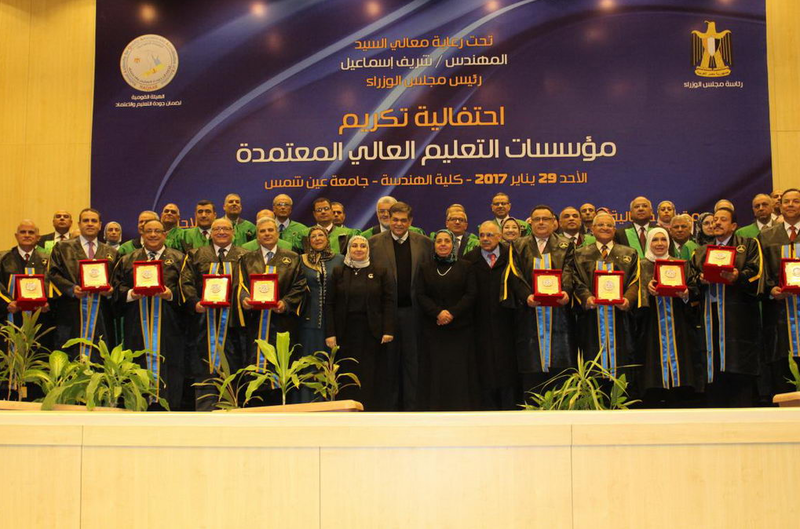 On Sunday 29th January 2017, prof/ Mohammed Kenawy -President of Mansoura University, was honored by the National Authority for Quality Assurance and accreditation, through a ceremony organized the by Authority at the Conference Hall at the Faculty of Engineering – Ain Shams University. The celebration was under the auspice of Eng. / Sherif Ismail - Prime Minister, to honor 17 deans of accredited faculties, and programs. Prof/ Azza Agha –Authority Vice- President for education affairs, pointed out that the total number of accredited organizations are 105, and the total number of governed faculties are 86 out of 391. Prof/ Johansen Eid – Chairman of the authority board, assured that the ceremony is to honor 17 university's presidents, 43 faculty's deans, who revive the spirit of hope and optimism in the light of the challenges facing the nation. She explained, that a good education, and a good culture, protect the homeland and develop the human, material and natural resources. And asked all honored presidents and deans to make sure that all graduates are appropriate and qualified for the labor market not only in Egypt, but the international level. prof/ Kenawy, assured that this honor is a new maturity of the University of Mansoura, as there are actually seven credited faculties and that the university works on accrediting 3 more faculties. Prof/ Ahmed Zaki Badr, congratulated the university's presidents and faculty's deans, pointed out that the development has taken a real place in higher education institutions.